The plan was to row a 5x1500m on the water, first thing in the morning. This plan didn’t survive the time I needed to scrape the ice off my car windows. The North Pole has decided to send its weather our way. Temperatures are around 0, windy, with icy rain, hail, and other nice stuff. Snow is expected for tomorrow. The official training plan for the Masters in our club has a light week, but I have decided that training properly is more important than performing on coming weekend’s races. So plan B was to do the session indoors and compare with a similar workout of a few weeks ago. First, I needed to reinstall Painsled. My “beta tester” version had expired, so I had to download the “ordinary” version. This involved going upstairs to tell my son to stop downloading videos. After a 2k warming up I started the main session. I set it up as a “ReRow”, with my previous session as a pace boat. I managed to follow the pace boat for the first three intervals. At the start of the fourth interval I saw that my pace boat was getting faster. I was now chasing a 1:50 average. After 1000m, the wheels came off. 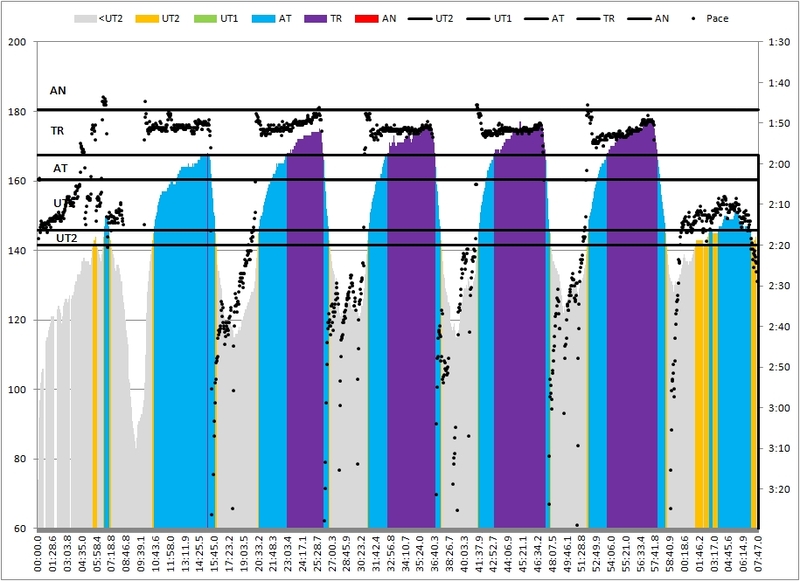 The only nice thing about it is that I have the workout compare functionality on rowsandall.com to see this happening in real life. 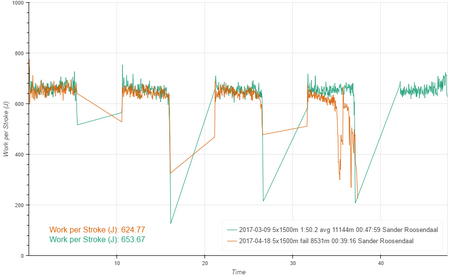 Unfortunately, the last time I rowed this with my defect Wahoo Tickr, and the heart rate values were not reliable. Training plan said it was a high volume week. At the same time, I was going to spend Monday to Thursday in Madrid, Spain, to represent my employer at a big industry trade show. Traveled to Prague by train, then flew to Madrid. In bed at 1:30 AM. No exercise. Not a show day, but I had to review a large number of documents. Slept in a bit, then started working in my hotel room. In the afternoon I went to the hotel gym (3×4 meters with a few dumbbells, a threadmill and a cycling machine. I did 10 minutes running on the threadmill, 10 minutes of pedaling, then 10 minutes of running. An interesting observation. In the first 10 minutes, my average heart rate was around 140 bpm. In the final 10 minutes, with the same threadmill slope and speed, my heart rate was around 120 bpm. Quite a significant difference. After that I did 45 minutes of strength training in the hotel room, using body weight and elastic bands. All in all a pretty good session. I also planned out the exercise for the rest of the week so I would achieve the prescribed volume and type of training. Alarm clock at 5:45 to go running in the park. Woke up and discovered that it is still dark in Madrid at that hour. 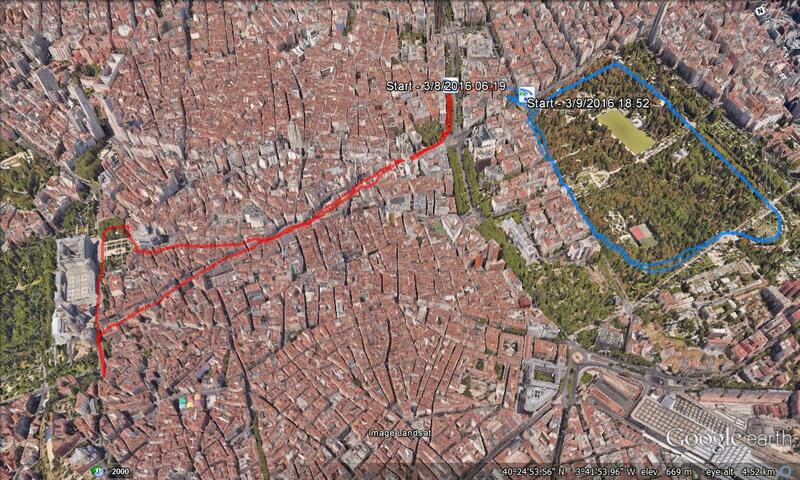 I hesitated for about 20 minutes, then went for a short run, not in the park but through the city center. The Madrilenos were getting into taxis or staggering home on foot. There were a few other runners. Did just 40 minutes instead of the planned 60 minutes recovery run. A full day at the show, standing around, having meetings. Quite tiring and some adrenaline involved as well. I had meetings planned from the opening of the show to the closing time, and then a dinner. This was the second blow to my plans. There was simply no time to exercise. During the day the starting time of the dinner was moved to the right, and I was able to start my final meeting early, so that created a 40 minute slot for running. Took to the park and did two quick rounds. Quite far from the planned 12 km. We had a very nice dinner at La Cocina de Maria Luisa. An excellent restaurant with a very nice atmosphere, delicious food and excellent wines. In bed around midnight. Alarm clock at 4am to catch the plane. Ouch. This was hard, especially after the late dinner and the excellent wine. On top of that, Madrid Barajas Terminal 2 is an “old” and inefficient terminal, and this Thursday there were large groups of weekend travelers, people who are not used to the airport security drill. You can’t blame them, but that in combination with super strict checks and very unfriendly and slow personnel, on top of my lack of sleep, made it a not nice experience. Slept in the plane. Woke up to admire the Mont Blanc Massif, then fell asleep again. Sprinted through Frankfurt to catch the connection to Vienna. Train home. Arrived at three in the afternoon. 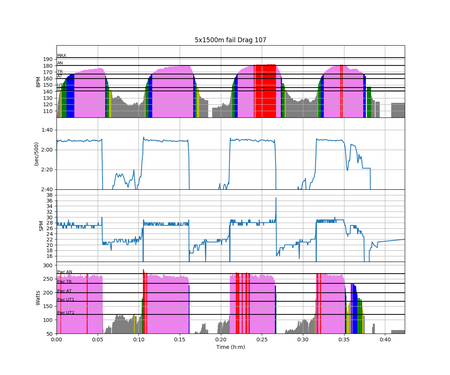 At four I sat down to do the planned 5x1500m/R5 workout. First time on the erg in almost 2 weeks. 1:52.7 – lost a bit. The “seconds in the bank” is my number mind game. 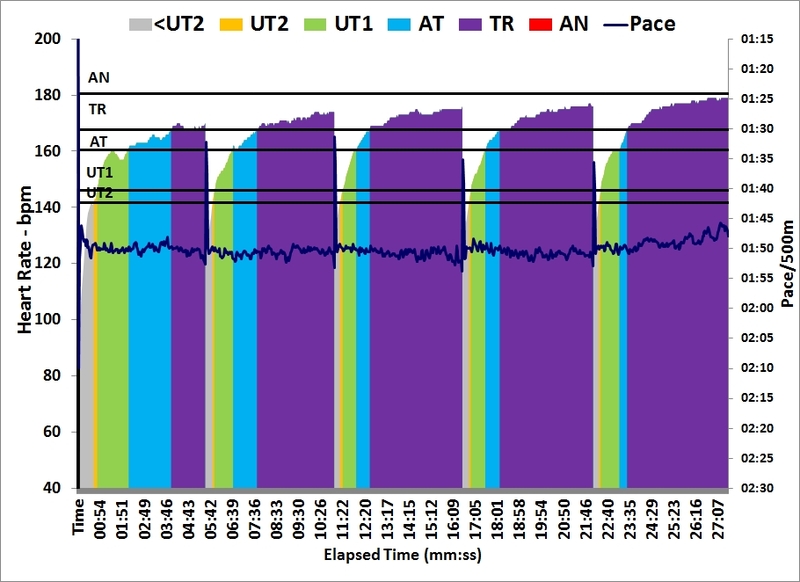 I basically count how many cumulative seconds (per 500m) I am under the average, so I know how much I can afford to slow down and still make the target pace. After just 4 hours of sleep, I just didn’t have the mental energy to do anything faster than the target pace that I agreed with myself. In the end the average pace for the session was 1:51.3. I did it. That’s all I can say. Tired now. 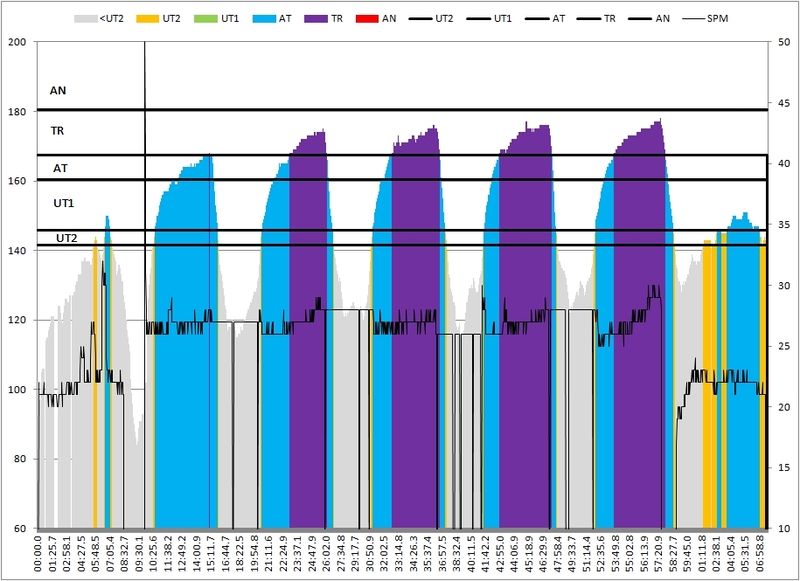 Ben Redman posted a link to an interesting series of articles on endurance training in his latest blog post. 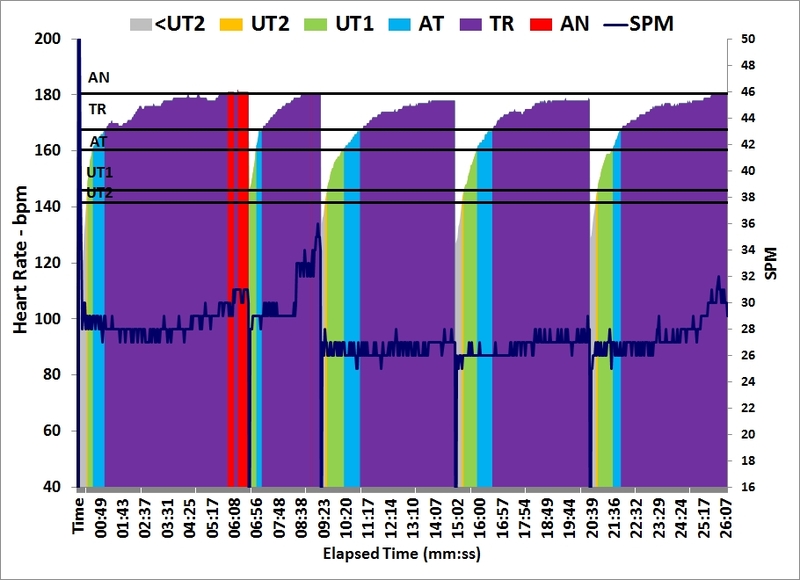 Great reading to stimulate thoughts on rowing training for time pressed people. My ride to work this morning was a bit slower than usual, because it was mighty cold and the mist was freezing to some sections of the road. I didn’t fancy a fall so I drove carefully. Riding my bike I got cold hands, which made me think about my super-low lactate readings of the past two days. I guess my difficulty to get good blood flowing is to do with the low temperature in my rowing basement. The thermometer on the wall indicates something between 8 and 12 degrees C.
I also expressed fear that the low temperature might cause the readings to be lower than normal. 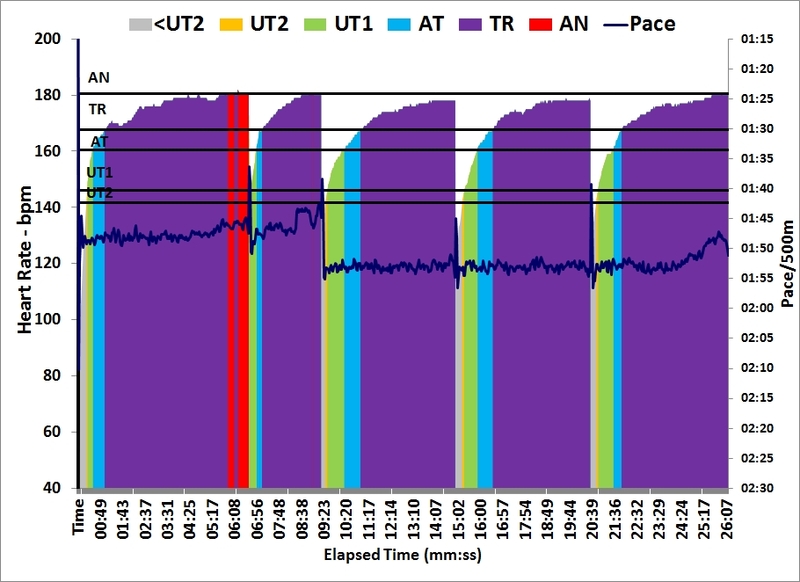 I posted these thoughts on the Lactate training thread on the Free Spirits rowing forum. By the end of the day Boris (“dr3do”) had responded that indeed according to him lower temperatures give lower readings and I should do my measurements at normal room temperature. Then I made the mistake of posting a response before thinking, and as any new convert going through excitement, expectation, disappointment and frustration, I overreacted. On a public Forum. After 20 years of being on the internet I should know better. Anyway, I apologized and I hope everything will calm down and be back to normal. Indeed, lower than the 8 degrees measured on the wall. On Thursday I will do an experiment to confirm (or, hopefully, falsify) my fear. I will take two strips to the basement and leave one prepared in a heated room. I will do a 60 minutes steady state, and take a lactate measurement immediately after. Then I will do a 1km very light cooling down and take another measurement. Finally, I will walk up the stairs and take a measurement with a warm strip. The two last measurements should be close. If the “warm” measurement gives a higher reading than the second “cold” measurement, I am in trouble. 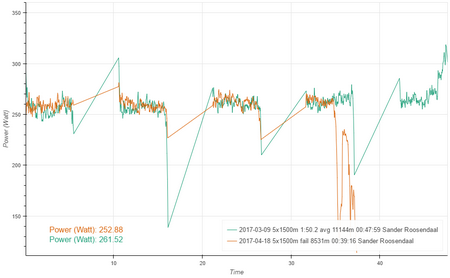 Today’s training was a good old 5x1500m. Target pace was 1:50.7 which I was not looking forward to. At least I was able to channel my forum faux-pas frustration and focus on the splits. 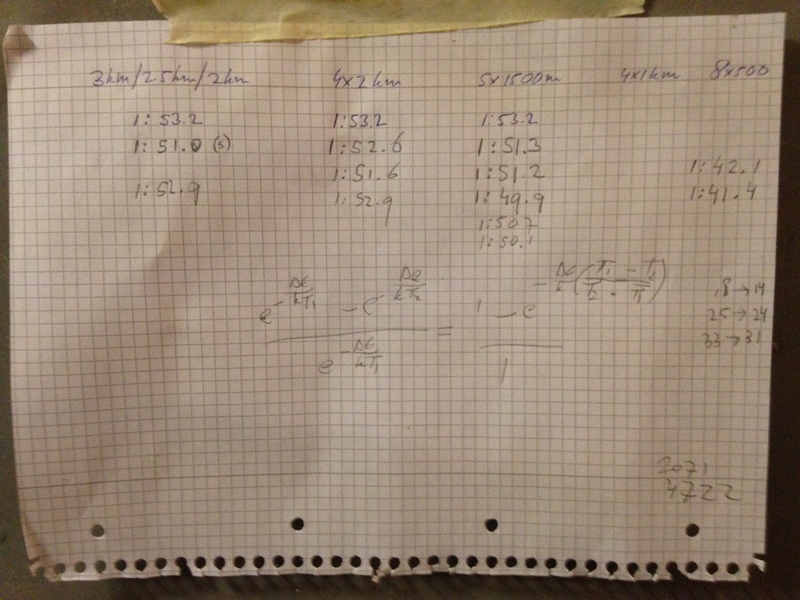 The scribbled equations were written during the breaks of the 5x1500m. I was thinking about enzymes and the temperature dependence of their activity. Being a physicist I couldn’t come up with anything better than something looking like an Arrhenius equation. That doesn’t bring me any further because I don’t have a clue what typical activation energies would be for enzymes, let alone if they follow Arrhenius equation type behaviour. Also I would have to guess about the temperature in the strip. The plastic housing looks quite a good heath insulator. Then you pour warm blood into something that is probably around 5 degrees C. We are looking at a temperature difference that is probably a bit smaller than 294K – 278K. Basically if the reaction rate would half between these two temperatures, then the activation energy would be 31 kJ/mol. However I am afraid that with enzymes as a catalyst, things are probably not so simple. May look into it but I fear the experiment is a more useful way to determine the effect. Tomorrow is a resting day. An old rowing friend has a business trip to Prague, so I will join him for a beer and a dinner. 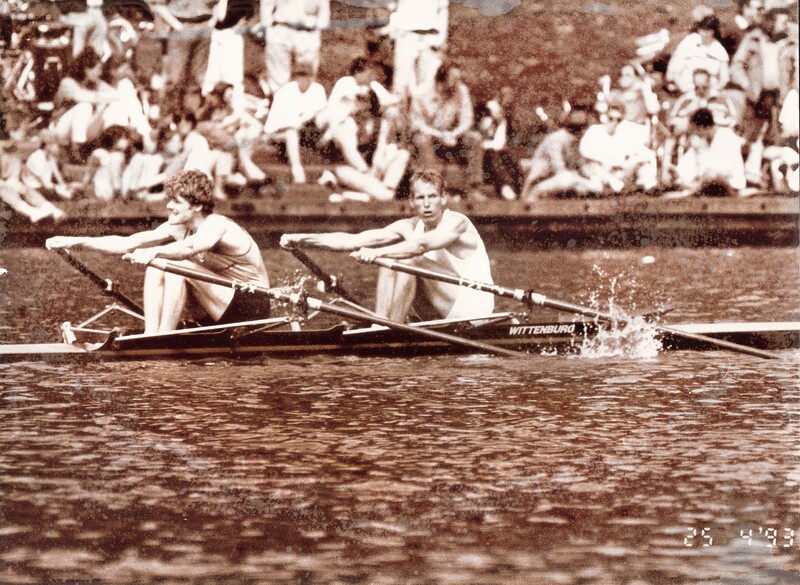 Here is the two of us rowing the double in Amsterdam in 1993. I am the stroke rower and Ele Jan is the bow.